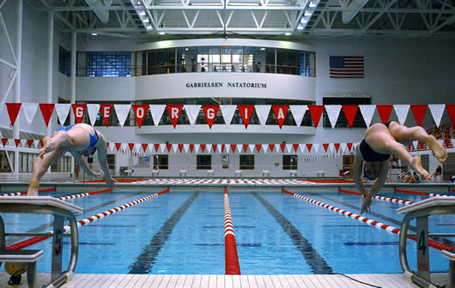 The history of the University of Georgia’s aquatics program runs as deep as the waters in which their athletes swim. To maintain the school’s strong legacy and continue to recruit top athletes, the university commissioned Counsilman-Hunsaker to design a world-class venue that would live up to and fulfill the Bulldogs’ excellent reputation. The state-of-the-art natatorium was appropriately named after their infamous head coach, B.W. Gabrielsen, who helped mold the swim program to what it is today. The aquatics venue has hosted numerous international competitions and trained some of the best aquatic athletes, including three conference team champions, six All-Americans, and an Olympic team member. The facility was the official training site for guest Olympic swim teams of the 1996 Atlanta Olympic Games as well as the site of subsequent swimming and diving National Championships.